Hi everyone! 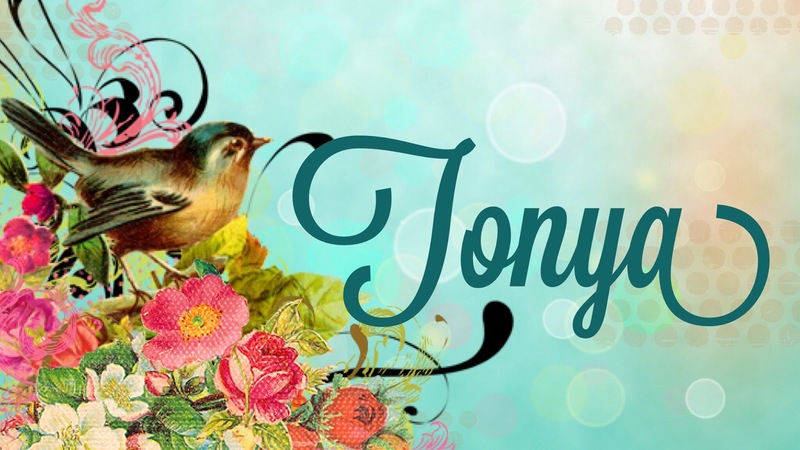 It me, Tonya and I am here to share a card that I created. This month’s theme is butterflies and this is what I came up with. I started by using the Scallop Card #3 diecut which I cut from Gold and Kraft and Damask cardstock. I then stamped the sentiment (from Paper Studio) onto a piece of white cardstock, inked the edges and adhered two pearl Dew Drops to the swirls on the sentiment. 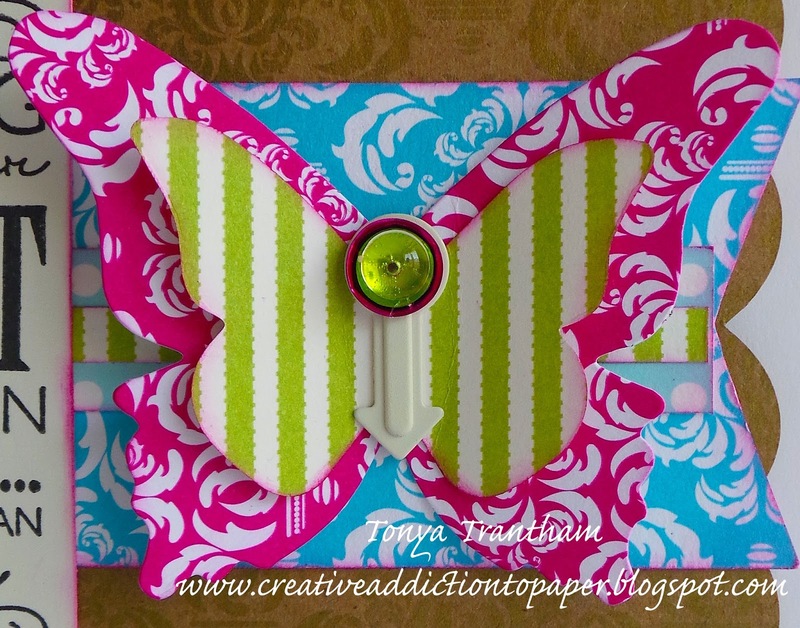 Next I cut from a variety of Canvas Corp cardstocks: Turquoise and White, Hot Pink and White, Lime Green and White Ribbon and Blue and Ivory Mini Dot Reverse) the banners and butterflies (retired Stamping’ Up! 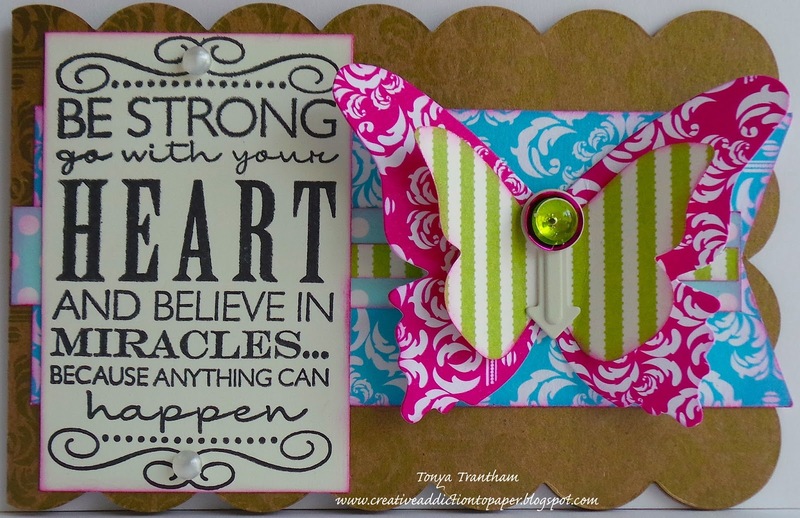 Sizzix Beautiful Butterflies). I inked the edges of the banners and then adhered all pieces to the cardbase. I used a 7 gypsies Photo Turn (retired) for the body of the butterfly and I added sequin and a Dew Drop for the head. If you have any questions about this card please let me know.